From late August 2017 through mid-September 2017 follow udpates for the Race to 10 MPG by joining our email list and/or following Cumberland and Sharp Transport. We’ll be sharing pictures, route updates, MPG stats and video along the way. Sharp Transport’s first of two drivers, James Thorne, went out in Cumberland’s C10 LT demo truck on August 18, 2017. 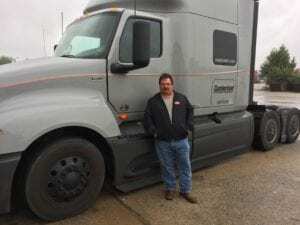 David Gooch, Sharp’s second driver started his trip on September 1, 2017. Both drivers will complete the same route to see who can average 10 miles per gallon through several states and back to Middle Tennessee. Read all Race to 10 MPG articles.